Snapchat, home to horrors like Face Swap, Wrinkle Filter, and Puking Rainbow (RIP), has a new torture device intent on terrorizing innocents in the night: an animated Ed Sheeran, who appears out of nowhere to sing at you. Not even the filter that gives you mouths for eyes could spawn as many bad dreams as this. Animated Ed Sheeran comes courtesy of his new World Lens, which debuted yesterday in honor of his Beyoncé collaboration, “Perfect,” dominating the Billboard Hot 100. If you choose to activate the filter, cartoon Ed will approach your Bitmoji, guitar in hand, and serenade you with “Perfect” while some snow falls. The good news is, there’s a cat. The bad news is everything else that is happening. My god, look at it up close. 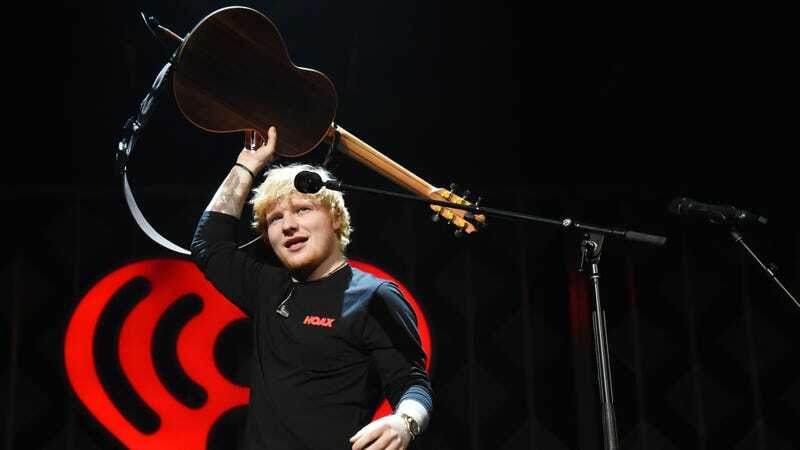 Sheeran, who a friend once described as “someone who listened to ‘Desert Rose’-era Sting and thought, ‘Yes, I can do this, but somehow worse,” had a number of big hits this year, and according to Forbes he just became the only musician to have more than one song streamed 1 billion times on Spotify, as if you needed one more reason to douse 2017 in napalm.